You find pleasure in surprising people. 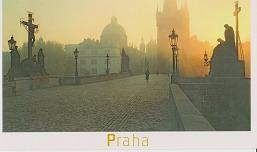 Sending someone a postcard from Prague will surprise them. You want someone to think you are in Prague (eg. your boss, a nagging x, your parole officer, the bill collector). You are sad and need to cheer yourself up by sending yourself a postcard. You just visited Prague and forgot to send your mother a postcard. You like this website and want to show your appreciation by sending it money. The postcard was purchased in Prague for approximately 25 cents. 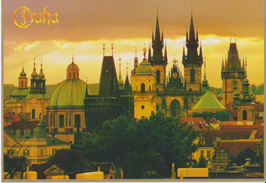 The postcard will be sent via regular mail with a Czech postage stamp that cost 1 dollar. The postcard will be handwritten in blue or black ink. I consider myself a neat writer. There is no mention of this website on the postcard. Every postcard ordered generates a profit for this website of $2.75 (not including the 10 minutes of labor required to write the card). To see how much money this website has made from mailing postcards please visit the revenue streams page. The postcard will be sent within 24 hours of payment received. Why postcards?...find out why this website is mailing postcards. You got to be sending it to somebody, even if that somebody is you.? The street and specifically the house on the street? Atleast a town or a villiage. Where do you go to pay your parking tickets. If you do not know country, are you sure you need a postcard? If you enjoyed this website, please share. Thank you. Blog Or Website - Which is Right For You? Month 1 - It Works! 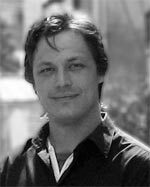 Month 5 - What Is The Point? Feel free to contact me with any questions or comments and visit my Google+ page.